Do you know Jack Wolfskin? You would think, if you’d met him, you’d remember a guy with an unusual name like that! So if the name doesn’t ring an immediate bell, you probably haven’t encountered him … yet. Jack Wolfskin is a comprehensive active outdoor brand launched in Germany back in 1981. Since then, it ranks among the most widely recognized outdoor wear and gear brands across Europe with 238 stores. Worldwide, Jack Wolfskin has 900 of their own stores in total with 660 of them in Asia – particularly in the booming Chinese outdoor market. There are more than 4,000 points of sale around the world. 50 Campfires was introduced to Jack Wolfskin, initially because of our unending search for cross-over outdoor clothing, footwear, and gear that serves well in both the city during the week and in the woods on the weekend. This is exactly the type of gear with which Jack Wolfskin made its mark … and continues to purvey today. Besides the enormous line of outdoor gear, Jack Wolfskin takes its “at home outdoors” motto to heart, backing it with social responsibility for the environment its customers cherish. The company is involved with numerous programs ensuring sustainability with everything from renewable energy policies through sustainable shop design. They proactively participate in programs to ensure fair and safe working conditions worldwide, and have been awarded for their efforts. 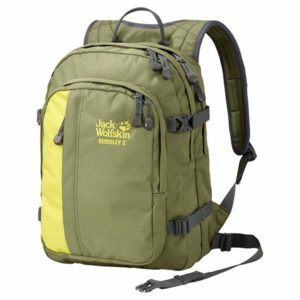 While Jack Wolfskin products are lesser known in the United States, a wide selection is available for purchase from retailers and catalogers like Sierra Trading Post, Eastern Mountain Sports and Zappos. 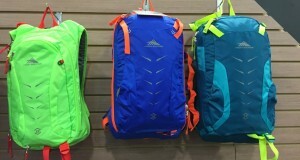 What are Jack Wolfskin’s products like? There’s also a wide selection of Jack Wolfskin products available on Amazon, which is where we pulled this selection across the brand to make you an introduction! 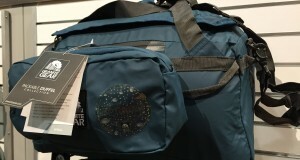 A 32-litre capacity travel pack with technical design to be carried as a travel bag or as a pack. Features a main luggage compartment, four additional compartments, and a place for a laptop computer. 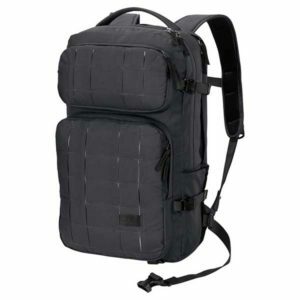 A superb bag for active outdoor use and the travel required to arrive at the trailhead … whatever that might entail. A compact and comfortable day pack featuring wide shoulder straps on the Snuggle Up suspension system. There are two main compartments and three additional pockets. This inexpensive pack serves equally well as a book bag for school, an office commuter, or a light compact pack for day hike wear. Headed for a tropical destination to beat the winter blahs? Don’t go without your own private, go-anywhere beach shelter. It provides instantly customizable protection from sun and wind that YOU control, and the option to seal it up completely if you choose. Weighs just 5.78 pounds. Lightweight 3-person dome tent with innovative ventilation system. 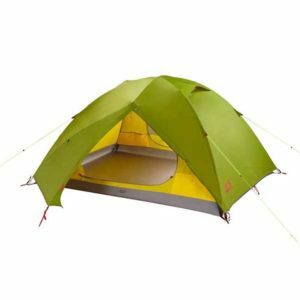 Includes ome inner tent, one flysheet, two vestibules and two entrances. 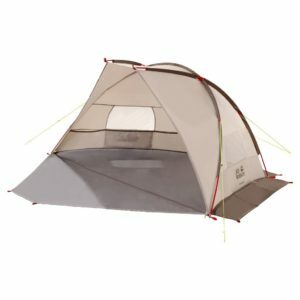 This is a great “keep it in the car” tent so you always have a decent tent at hand should the need arise, and the price is right. 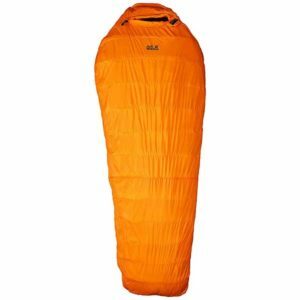 This is a serious sleeping bag for serious conditions – like the kind you face if you decide to go winter hammock camping! Think how cozy and snug you’ll feel, swaying gently in a bag rated down to 20-below-zero! Features Thermozone technology, an extra layer of Microguard Maxloft in the hood and footbox. Extra-wide mummy shape has reinforced lining. Compression stuff sac is included. 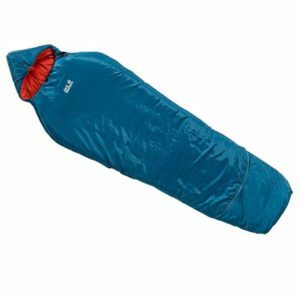 Comfortable 3-season sleeping bag with size-expansion options. Two-stage adjustment of the foot section allows bag to grow as the child does. Features mummy shape and wide blanket shape in one package. Extra warm footbox. Stuff sack included. 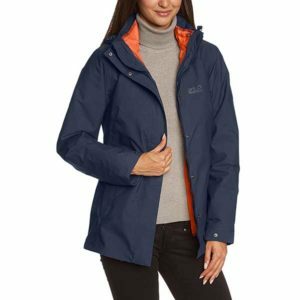 The women’s Vernon Jacket is a classic example of Jack Wolfskin’s cross-over wear. It has both styling and features perfect for the hiking trail and the daily commute … however you do it. Hood is detachable and will adjust for both size and field of view. This is a true 3-in-1 jacket with a warm, quilted inner jacket. 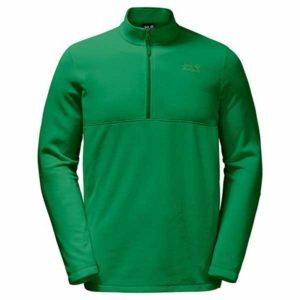 Super lightweight sweater that can be worn as a base layer or mid layer for active outdoor wear or to the office as a nice, business casual type of sweater in cool weather. Made from Tecnopile Micro microfleece. Available in a range of colors across the spectrum. As comfortable on the trail as the sidewalk as in the coffee shop. 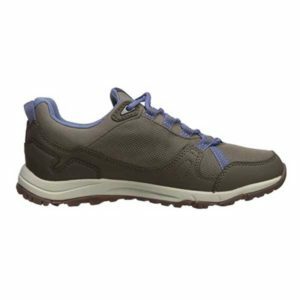 The Activate is a lightweight, multifunctional, modern style hiking shoe. It built with an internal Texapore waterproof, breathable membrane and the Circuliner breathable, fast-drying polyester liner. External construction is both leather and synthetics. Rubber sole. Take a glance. Make your guess – serious hiking shoe or casual street wear? Don’t worry … there are no wrong answers here! The external construction is of hydrophobic Nubuck Leather. Features the fast-dry, always-comfortable Circuliner system. 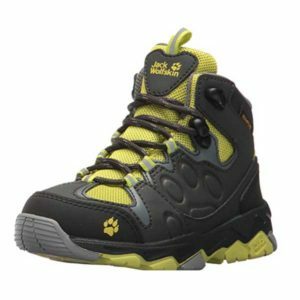 Sole is Jack Wolfskin’s Wolf Hike Prime of pure rubber. Insole is removable for even faster drying turnaround. When it comes to fashion, kids are sometimes the most difficult of all customers to please. 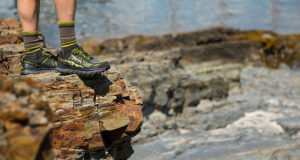 The Mtn Attack 2 will have no problems satisfying the most discriminating youthful tastes. This shoe looks and wears urban, but performs on the trail just as well. 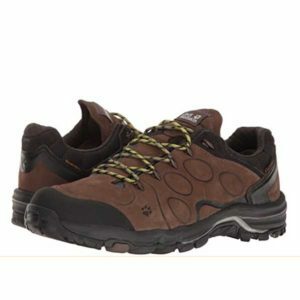 Includes Texapore membrane, Circuliner lining, and all the other features of Jack Wolfskin’s premium adult shoes. Available in Flashing Green or Fuscia. If you’re only going to have one kind of socks, those stocks should be Merino wool. 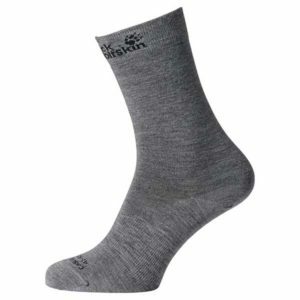 Jack Wolfskin offers a lightweight, classic cut sock in 61% Merino, 35% Polyamide, and 4% Elastane. These everyday socks provide all the benefits of Merino – include the odor-neutralization properties – at a great price.